Jean-François Millet, the great Barbizon painter whose work ennobled peasants, died at 60, in January 1875. Five months later, his patron, the architect Emile Gavet, suffered a financial setback, and put his collection of Millet pastels up for auction at the Hôtel Drouot. Katie Hanson, the Museum of Fine Arts’ assistant curator of paintings, sets that quote on the wall in “French Pastels: Treasures From the Vault,” a summer rainbow of an exhibition up well beyond summer, through Jan. 6. She cites van Gogh for good reason: the MFA, which has a splendid stable of Millets, has 12 of those same pastels here, making up nearly a third of the 38 objects on view, most of which come from the museum’s collection. The show is a rare treat. Pastels often supplement larger exhibits, but infrequently get their own spotlight. And they deserve it — they’re a tricky, versatile medium: powdered pigment that can be fastened into a stick to draw with, or pulverized and smudged, or mixed with water. They are fugitive and tactile: Think of the burst of a fresh strawberry on your tongue, the touch of velvet and chenille, the ephemerality of melting snow and dandelions gone to seed. Their delicacy and light sensitivity match the fleeting nature of their subject matter. We won’t see these works again soon; because of their fragility, they can be exhibited only once a decade. 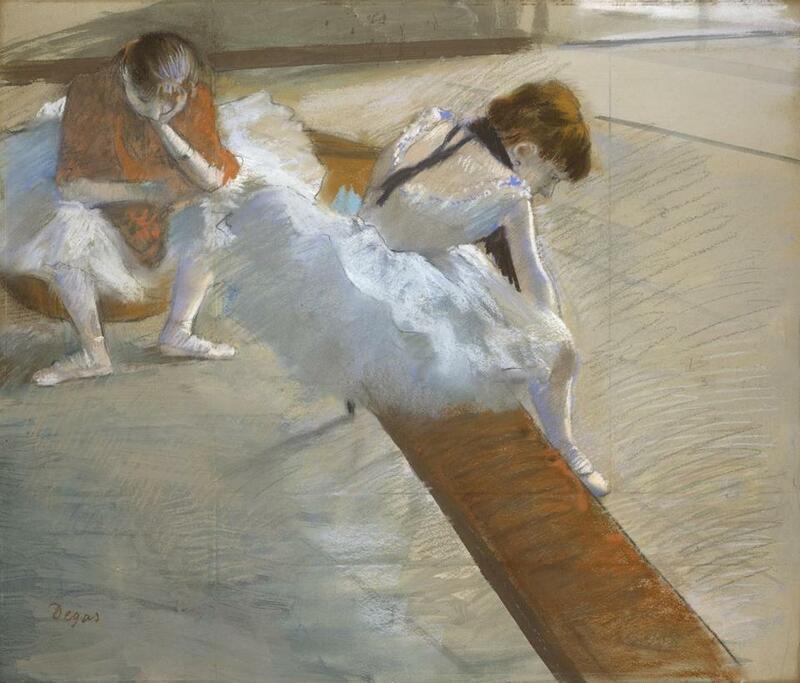 Edgar Degas’s “Dancers Resting,” a midcareer work, offers a lesson in the medium’s elasticity: He drew fine lines in the dancers’ hair, rubbed in shadows beneath a seated girl’s tutu, and made a paste to brush in the bench she sits on. His aim here was a realist’s, fine-tuning the textures of the scene. In the later “Dancers in Rose,” Degas applied pastels, then fixed them, then applied more — layer upon layer upon layer. The crumbly medium began to skip over the surface, so the costumes here appear almost as gold-threaded brocade. “Dancers in Rose” isn’t about evoking reality. It’s about the sting and shimmer of color and light — and the artist’s mastery. Pastels had been in favor in the 18th century, used frequently for aristocratic portraiture. Like the aristocrats, they fell out of fashion after the French Revolution, but the mid-19th century saw the invention of synthetic dyes, which invigorated the medium’s palette. Impressionists, hungry for more color and bewitched by the notion of evanescence, recognized pastels’ value. With them, artists could execute on the fly. For portraits, they were handy to quickly record affect and expression, without the labor and long-term intimacy oils required. Late in life, Edouard Manet was confined to a wheelchair when he made a pastel portrait on canvas of the writer René Maizeroy. Pastels were easier for him to use than oils. Convenience aside, they seem the ideal medium for this insouciant, foppish fellow, alert and ready with a bon mot. In solid, anchoring passages, Manet mixed pastels with water for the opaque gray ground, and smudged the powder for the coat draped over the writer’s arm. But for Maizeroy’s suit — for the man himself, in a subtle plaid — he used dry pastel, which bristles with liveliness, and sometimes skips across the canvas. But let’s get to Millet. He was sure-handed with a labile medium, expressing diaphanous and bold forms, sometimes to surprising effect. If you think of pastels as brilliant, “Two Men Turning Over the Soil” is no glad pastoral: It seethes with smoke and sweat, and “Farmyard by Moonlight” is a nocturne, made with black conte crayon. Still, its full-moon night has its own otherworldly radiance. We look as if from a window onto a yard inside a gate. The moon infuses the sky with silvery blue, limns a plow, and throws trees and buildings into eerie silhouette. In the deep shadow, a nearly invisible black cat ascends a ladder to a hayloft. 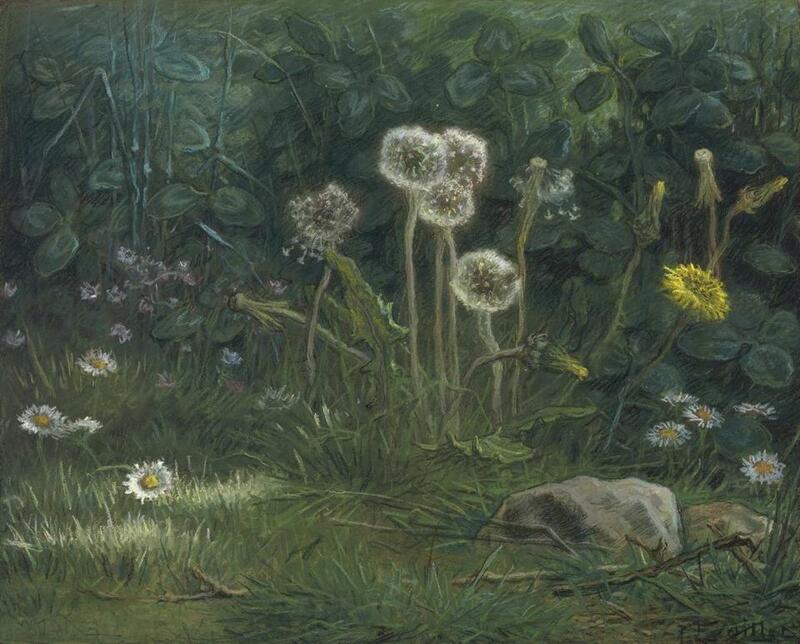 Millet is the author of the aforementioned dandelions, which he appears to have rendered lying on his belly on the forest floor, looking up at the sun-kissed, spherical sprays as if they were hovering angels. “Millet is father Millet,” van Gogh wrote to his brother Theo 10 years after the Gavet auction. “Counsellor and mentor in everything for young artists.” The younger painter copied his idol studiously until he died. But despite his religious experience at Gavet’s auction, he only rarely worked with pastels, and there are no van Goghs in this show. Other artists who saw Gavet’s collection are here. 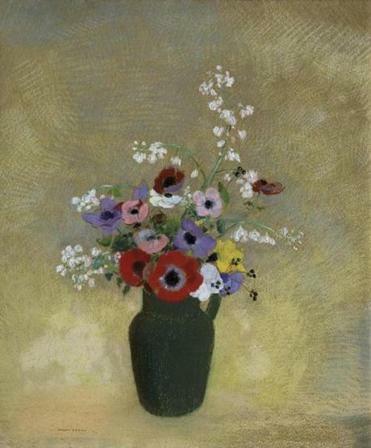 Odilon Redon’s “Large Green Vase With Mixed Flowers” has a place of prominence. It’s nothing like Millet’s sprightly dandelions, and indeed it was made decades after the auction, when art’s aims had changed. Where Millet adhered to a lyrical realism, Redon — not unlike Degas with “Dancers in Rose” — heightened his still life to a fever dream. Just above the earthy green vase, a red anemone perches like a siren calling, the red powder so dense and sumptuous you may want to bathe in it. Lush purples, yellows, and pinks surround it, and Redon’s gold ground ripples through a space that’s undefined. The red blossom is a moment of divine impact; the gold is the pulsing afterglow. Enough said. Put off thy shoes from off thy feet, and get thee to that holy ground.